Bet Acceptance and Transaction System (BATS) is Dusane Infotech’s proprietary centralized betting system which offers betting operators a turn-key transactional and EPOS (Electronic Point of Sale) solution. The betting system allows betting operators to accept a variety of fixed odds bets on various betting games like Lottery Games, Virtual Games, Sports Betting, Casino Games and other form of traditional betting games. Betting system can be accessed over the internet from betting terminals setup at traditional betting shops or modern betting lounges. All the betting terminals installed across betting retail shops are connected to central BATS betting system which manages overall game logistics. It is the most cost effective, secure and reliable way for betting operators. Players come to the shop and betting operator places a bet on behalf of the player over the terminal. EPOS or Mobile POS is another popular way to manage betting game inventory and distibution. 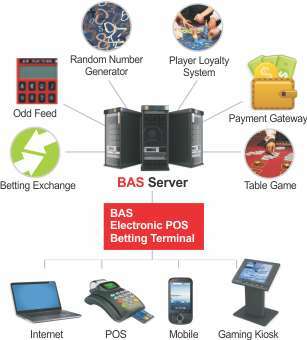 EPOS are connected over GPS to the centralized BATS betting system. Independent and authorized betting operators go door to door and issue printed tickets to customers instantaneously in exchange of cash/ cards. Door to door accessibility significantly improves sales for betting operators. Dusane’s betting systems is compatible with all of third party POS systems available in market. Also Dusane offers its own POS system as per betting operator’s requirement. Dusane offers betting applications which players can install on their mobile phones and tablets. The apps sync with centralized betting system over GPS to complete the betting transactions. Player can keep track of his account, bets placed, winning numbers over the betting mobile application itself. The great convinience offered on the go is a big motivating factor for players to play often resulting in higher sales for betting operators. Dusane offers BATS betting system interface for gaming kiosks to install on self service kiosks installed at public places like malls, gas stations. BATS betting system is fully customizable to suit the needs of a betting operator for a secure, reliable and feature-complete betting solution. BATS betting system offers major functionalities like wagers, validations, reporting, inventory management, accounting and hotline management functions, to name few. With no single point of failure it does this in a reliable way ensuring continuous operations. The betting system maintains the integrity and transparency of all gaming operation and transaction data with its unbeatable security framework. Supports all major Lottery game variations including lotto, digit (2, 3, 4 digit etc. ), keno, bingo, traditional games, and more. Provides betting solution for Sports Betting Operators, Virtual Racing Operators and any Game Developers who intend to add transactions to their game. Supports multiple gaming channels such as point-of-sale terminals, web/Internet, mobile Apps, SMS/USSD. Provides full range of management capabilities for instant ticket (scratch) games including inventory management, distribution, validation, and accounting. Manages retailer accounts, including credit control features to restrict fraud or default by retailer. Banking system integration is also available for automated retailer payment processing and accounts update. Comprehensive reporting system for retailers as well as operators and auditors. Designed using a best-of-breed selection of key open source technologies combined with appropriate commercial software. Utilizes open standards such as XML and web services for easy integration with third-party systems. Modular architecture that allows for simple scaling from the smallest to the largest operation. Highly parameterized design allows for changes to be made without any software modifications. Browser based betting system administration for ease of deployment. Secure access for authorized personnel can be made available via any internet connected PC.